"This could have big impacts as winters become warmer and soils thaw more frequently," said lead author Carol Adair, of UVM's Rubenstein School of Environment and Natural Resources and Gund Institute for Environment. "If croplands move farther north with warming climates, this could increase the contributions of agriculture to global GHG emissions." While it's known that farmers' decisions to add nutrients to their fields affects greenhouse gas emissions during the growing season, Adair and colleagues find that these choices have long-lasting effects: they can increase emissions of powerful greenhouse gases, especially nitrous oxide (N2O), during wintertime thaws. "By injecting manure, farmers are trying to do the right thing and keep manure on the farm, in their soils and crops, and out of waterways," said Adair. "These results, in conjunction with our previous research that found injection to also increase emissions during the growing season, suggest that there may be important tradeoffs to consider when deciding on a method of manure application." GHG emissions result from the activity of soil microbes, such as bacteria, which break down manure into nutrients useable by crops. "During typical winters, when soils are very cold, microbes basically hibernate, but they are just waiting for the right conditions to be active again," said Adair. "When soils warm up just a bit—or thaw—microbes wake up and quickly start producing GHGs." The research team found that the method of manure application strongly impacted emission rates of CO2 and N2O—a GHG roughly 300 times more powerful at trapping heat than CO2 - from soils. During winter thaws, N2O emissions from manure-injected soils were up to 20 times greater than emissions from soils with surface broadcast or broadcast plus plow manure application. The researchers have some theories as to why GHG emissions are greater with manure injection and plan further study. "Microbes that produce CO2 and N2O need carbon and nitrate, and injections of manure 6-8 inches below the soil surface may increase availability of those nutrients," said Adair. "Another potential reason is that the manure application treatments change microbial communities; there may be more of the type of microbe that produces N2O in injected soils." "This study gave us an incredibly useful launching point for expanding this research, and enabled us to work with more Vermont farmers," said Lindsay Barbieri, Ph.D. student in the Rubenstein School and Gund Institute. "Together we're monitoring GHG emissions, alongside water quality, crop yield, and other measurements, from agricultural soils and practices. 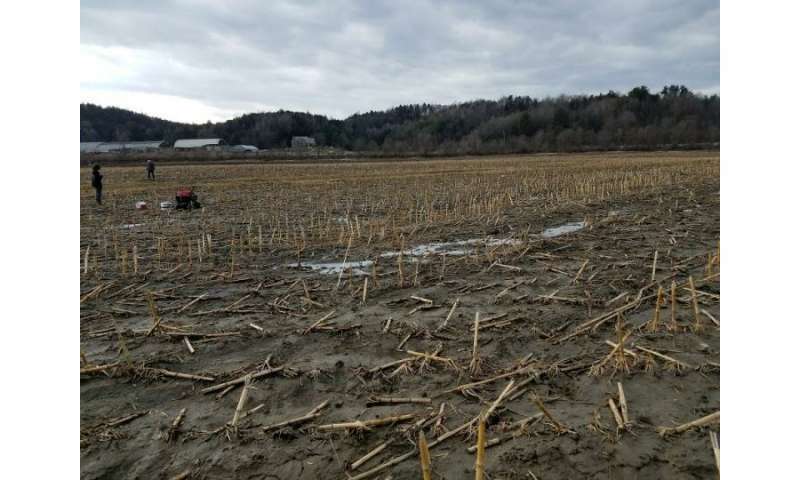 This is happening directly in the field, for longer periods of time, as we work to better understand the complexities of agricultural practices and the role of GHG emissions in Vermont."